Share Your GigMasters Reviews Anywhere! You’ve earned your praises from reviews - use them! 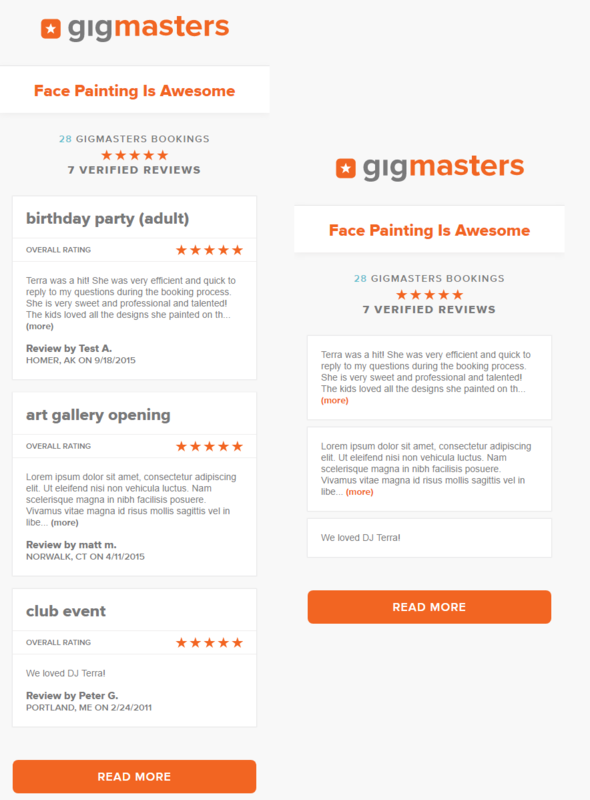 Now you can showcase your GigMasters reviews on your business website with the Portable Reviews Widget. With an easy-to-use html code generator, you simply need to copy and paste the html code into your personal website to start displaying reviews. It's that easy! We offer two sizes of the Reviews Widget to fit the needs of any website. To make a bigger impact on your personal website, the Full Reviews Widget lists reviews in long form. It's large enough to prominently highlight your reviews on any page! The Compact Reviews Widget shares the same information as the Reviews Widget version in smaller snippets and allows a user to click to read more. Its compact design makes it perfectly subtle enough to grace any pages short on space. You can customize whichever Reviews Widget you select by changing the order of your reviews. You can choose to display your favorite 3 reviews on your widget in the order that you prefer. You have complete control over the order in which your reviews are seen! Copy the updated html code in the generator and paste it wherever you're looking to share your reviews. Now, let’s start showing you off! If you need any help with the Reviews Widget, feel free to send us an email or give us a call at 866-342-9794. We're always happy to help!